By Melissa Lennig on September 5, 2012 8 Comments. This content contains affiliate links. As an Amazon Associate I earn from qualifying purchases. As we pulled into the driveway tonight after work, my oldest was the first to spot the amazing rainbow shining brilliantly over the lake. He pointed to it and said, “God must give rainbow surprises to little boys who had a good first day of preschool!” A few days later with the rainbow still on his mind, my son asked if we could do a rainbow craft. 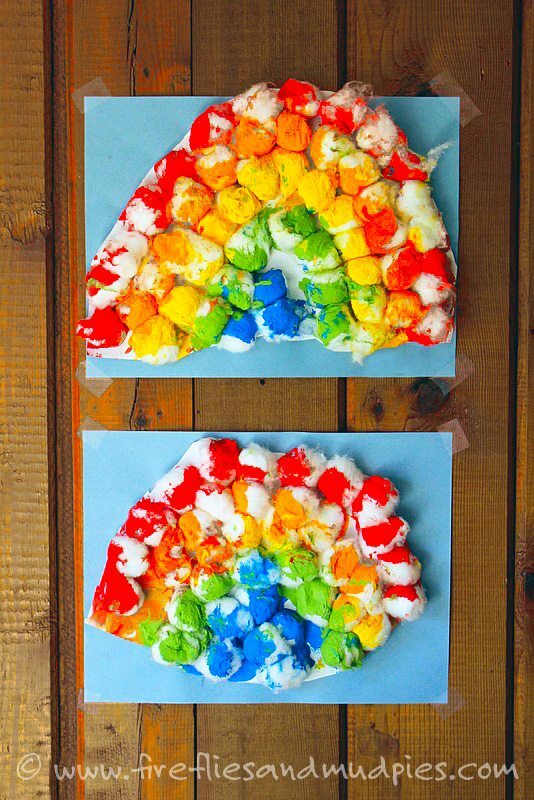 Shared below is a tutorial for a vibrant Cotton Ball Rainbow that kids can make independently! 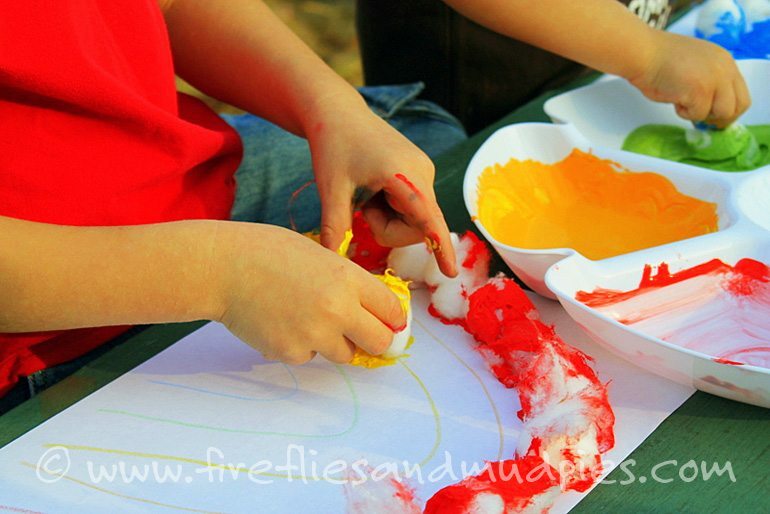 It’s a fun craft for learning colors and practicing fine-motor skills. 1. Draw a simple rainbow with crayons on the blue paper for your child to use as a guide. 2. 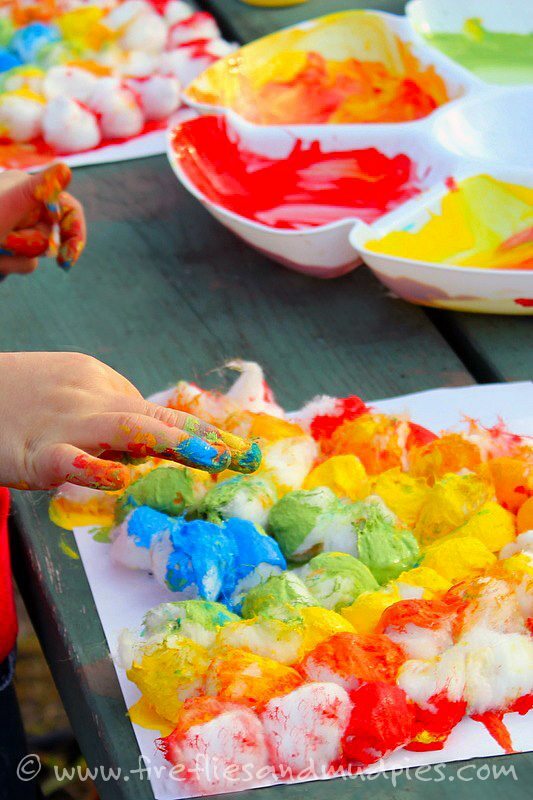 Show your child how to dip cotton balls into the acrylic paint and place them onto the matching color. 3. Continue placing paint coated cotton balls onto the paper until the rainbow is complete. Allow the painting to dry completely. For more rainbow crafts and activities, click HERE.